This article appeared in the magazine Films of the Golden Age #2, and was written by Eve Golden. "'One day I had fifty cents...and the next day I had $50,000'...As she took on the status of a full-fledged fad, there were Helen Kane dolls and Helen Kane look-alike contests, appearances on radio and in nightclubs. In late 1928 and early '29 you couldn't throw a brick without hitting Helen Kane." Helen Kane was born Helen Schroeder on August 4, 1903, in the Bronx. Things were not easy for Helen or her brother Louis; their Irish mother took in laundry, while their German father drifted from job to job. From an early age, Helen was starstruck. When she was in school at St. Auselin’s, she managed to convince her mother to come up with $3.00 to pay for a queen costume for the school pageant. But there wasn’t a great deal of money. “I lived way up in the Bronx,” she recalled, “and worked nightclubs far downtown. After the show at night I’d go home alone, with never the slightest fear...You could go anywhere without carrying your life in your hand.” In the mid-1920’s Helen married department store buyer Joseph Kane and took his name professionally. But she was a divorcee by 1928, when she was appearing at the Paramount Theater in Times Square. There, that old chestnut came true; Helen Kane went out a youngster and came back a star. She recorded scores of records (all novelty songs but for one ballad, “I Owe You”). 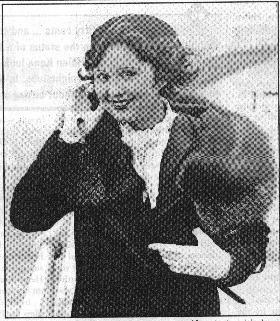 As she took on the status of a full-fledged fad, there were Helen Kane dolls and Helen Kane look-alike contests, appearances on radio and in nightclubs. In late 1928 and early ’29 you couldn’t throw a brick without hitting Helen Kane. She was certainly something new: tiny (about 5 feet tall) and slightly plump, she looked like a cupie doll come to life. Her round face with its huge brown eyes was topped by black, curly hair; her voice was a baby squeak with a distinct Bronx accent. Audiences found Helen adorable, though admittedly she grated on the nerves of more than one critic. In mid-1929, Paramount signed Helen to make a series of musicals. Her first of three 1929 films was Nothing But the Truth, a comedy starring Richard Dix as a man who has to go 24 hours without telling a lie. Helen’s role was small, but she got to sing “Do Something,” and made a good impression. From there she went into a cute college musical, Sweetie, which starred Nancy Carroll and Stanley Smith. Helen sang several numbers and was teamed with the delightful Jack Oakie—as usual, the comedy couple handily stole the film from the romantic duo. Helen’s third 1929 release was Pointed Heels, also in a small supporting role. This backstage romantic triangle featured William Powell and Phillipe Holmes vying for the attention of Fay Wray, while Helen and Skeets Gallagher provided the music and comedy. In 1930, animators Dave, Max, and Louis Fleischer decided to cash in on Helen’s popularity. They assigned staff animator Grim Natwick to come up with a girlfriend for Bimbo the Dog; the result was a caricature of Helen Kane, with droopy dog ears and a squeaky, Boop-a-Doop singing voice. “Betty Boop,” as the character was dubbed, became an instant smash hit and the star of her own cartoons. By 1932, she became human, her long ears turning into loop earrings (typical of Fleischer, though, she continued her inter-species romance with Bimbo). The Betty Boop cartoons of the early 1930’s (before censorship set in) were brilliant, exhibiting a sexuality and dark surrealism missing from Disney’s films. Helen Kane had some real competition on her hands. In 1930 Helen made another three films for Paramount, none of them with scripts equaling Fleischer’s cartoons. The first was an all-star review, Paramount on Parade. Helen had a cute musical number in which she played a teacher instructing her young students on Boop-a-Dooping. In Dangerous Nan McGrew, Helen moved up to her first female lead, as an Annie Oakley-type character in a Canadian medicine show. Her next film, Heads Up!, co-starred her with Charles “Buddy” Rogers (he was a Coast Guard officer, she was his rich girlfriend). The songs were by Rodgers and Hart, seemingly a good omen for Helen’s career. But Heads Up! was her last film. By late 1930, Paramount felt that the Boop-a-Doop craze was passing, and let Helen’s option lapse. She returned to the stage and radio, which still offered her a good measure of fame and fortune. All the time, though, Betty Boop was gaining in popularity; the Helen Kane dolls and look-alike contests of the late 1920’s became Betty Boop dolls and look-alike contests by the early ’30’s. 1932 was a busy year for Helen: she married actor Max Hoffman, Jr. (son of dancer Gertrude Hoffman), but the marriage lasted only a year. “He didn’t do any more stage work after we were married and he left me in Chicago in 1933,” she told Judge Allegretti at her divorce hearing. And in May, 1932, she filed a $250,000 suit against Max Fleischer, his studio, and Paramount Publix Corporation, charging unfair competition and wrongful appropriation in the Betty Boop cartoons. The trial dragged on for two years, the testimony getting more and more comical as Helen Kane and Betty Boop films were screened by Judge McGoldrick (no jury was called). Betty Boop voice-overs Mae Questel, Margy Hines and Bonnie Poe were brought in to testify; Helen denied copying her own singing style from black child performer Baby Esther or from a 1914 French song, “Bou-Bou-Ba-Ba-Bou.” The stenographer nearly had a nervous breakdown transcribing Boop-a-Doops and Bou-Bou-Ba-Ba-Bou’s. Amazingly, McGoldrick ruled against Helen in 1934. The judge “held that she had failed to prove that the defendants had appropriated her ‘baby’ style of singing,” according to one paper. “I consider it very unfair,” Helen quite naturally stated, “as all of my friends believe the cartoons a caricature of me.” Watching Helen and Betty side by side today, it’s impossible to fathom Judge McGoldrick’s decision. That ruling wasn’t Helen’s only trouble: in 1933 she had been fined $46,500 for a bad business loan. She’d invested in a dress firm through one Murray Posner in 1930; when the firm went bankrupt, Helen was left holding the bag. Indeed, the only good news for Helen was the show “Shady Lady,” which opened in July of 1933. “I am not going to talk any more baby talk and they will not get me to say Boop-Boop-a-Doop,” she insisted. “ÖI am going to be a sort of miniature Mae West.” After Shady Lady closed, Helen went back to the grind of vaudeville, radio and nightclubs. In 1934 she went on a strict salt-free diet and exercise regime and dropped 43 pounds. She was unrecognizable: slim, with longer hair and delicate bone structure which had been lost under her baby fat. At 31, she looked like a Hollywood ingénue. Helen wed for the third and final time in 1939. Her husband was master of ceremonies and well-known Broadwayite Dan Healy; the bride was 36, the groom 52. They opened a nightclub on 52nd Street, but it lasted only a year. Theirs was a happy marriage, and Helen decided to settle down “and be Mrs. Healy for awhile.” She faded from public view in the 1940’s. The Healys moved to a small home on 35th Avenue in Jackson Heights and Dan opened Healy’s Grill, on 66th and Columbus in Manhattan. Fame came calling again in 1950 when MGM filmed Three Little Words, the story of songwriters Kalmar and Ruby. Starlet Debbie Reynolds was cast as Helen Kane and given the song “I Want to Be Loved By You.” Helen was called in to dub Debbie’s voice, and was suddenly back in the limelight, at the age of 53. Television beckoned, interviewers were calling, and she even played the Palace once again in 1956. “With maturity has come a wonderful sense of humor and a great heart. She’s fat and funny and the face is as beautiful as ever,” wrote one reporter. Healy’s Grill didn’t bring in much money, and Helen admitted that “Dan and I couldn’t change a quarter.” Plump and cute again as in her Boop-a-Doop days, Helen was still choosy about the appearance she selected. “There is nothing more pitiable than a middle aged person, especially a woman, acting coy,” she once said. In March 1965 she appeared on The Ed Sullivan Show; it was her last hurrah. On September 25, 1966, she and Dan watched Debbie Reynolds in Three Little Words on TV. “She’s kind of cute at that,” she laughed. The next day, Helen died, at the age of 63. She was survived by her husband, brother Louis, and Betty Boop, who today continues to confound her unwilling creator.